Welcome to the New Center Services Director! Do You Need Software Training? Smiling, joyous Rinpoche in Mongolia, September 2008. Peals of laughter in Pomaia, Italy, June 2008. “The most important work is bringing harmony with people. It is important to have a soft, gentle heart, to have patience with those who are difficult even though you need to make the correct decision externally. Enjoy brief glimpses of Rinpoche on our streaming videos page, including Rinpoche blessing animals, leading a meditation on emptiness and raising a prayer flag pole! We rejoice in sharing this wonderful and well-deserved praise about the FPMT organization from an FPMT-registered touring teacher, Andy Wistreich, with you! Rinpoche at the end of profound teaching in Pomaia, Italy, June 2008. Doris Low, from Singapore, has joined the International Office team and will formally take over from Claire as Center Services Director on December 15. 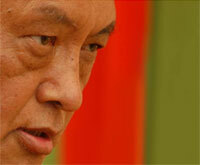 Doris has been FPMT’s Asia Pacific Regional Coordinator since 2002, and has a broad and deep familiarity with FPMT. She became a Buddhist under the guidance of Lama Zopa Rinpoche in 1991. 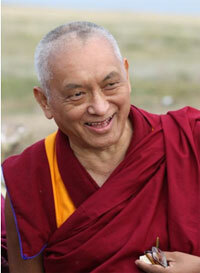 Rinpoche remains her principal teacher; his vision is her inspiration. She often travels out of Singapore in order to attend his teachings, and each year, undertakes month-long retreats with his advice. Her role as Asia Pacific Regional Coordinator has given her a direct involvement and point of personal contact with FPMT centers, projects, services and fellow students. She has also helped coordinate FPMT-registered teachers’ visits to the region. At Amitabha Buddhist Centre in Singapore, Doris regularly helps with Dharma publications. For example, she edited and oversaw the production of the Centre’s commemorative yearbook in 2007. Doris’ devotion to Lama Zopa Rinpoche and his vision for the FPMT, her cultural background and ability to converse in Mandarin and Cantonese, as well as professional experience in corporate communications mean that she is excellently-qualified to serve you all as Center Services Director. Progress is being made with the groundwork planning for Light of the Path (LOP), a quintessential lam-rim experience with Rinpoche, starting at Kadampa Center, USA Oct 1-15, 2009. Please keep an eye out for updated information on the web and in future issues of the FPMT News. You will not want to miss this! Ven. Joan Nicell, Masters Program Coordinator in Italy, has prepared a very inspiring report on the last Masters Program for immediate viewing. Consider printing some portions for your bulletin boards. Heart Practices for Death and Dying is now available at the Foundation Store. This new volume contains all the essential practices to be performed when someone has died as advised by Rinpoche. Together with its compendium volume Heart Advice for Death and Dying (out in Dec-Jan), these volumes update and replace the earlier edition Advice and Practices for Death and Dying. While nothing in this earlier edition is incorrect, we received feedback that it was cumbersome and difficult to use, and so we have split the volume in two – advices and practices – and added more advice! An abbreviated two-day Foundation Training in Compassionate Service was joyfully offered by Allys Andrews and received by more than 40 students at Chenrezig Institute as part of the Australian Regional Meeting Nov 12-13. Shortly thereafter, a successful one day Inner Job Description (IJD) training was led by Amy Cayton as part of the North American Regional Meeting on Nov 23. Participants, as always, were happy to get to reconnect with who we are, what makes us different and to discuss ways of integrating the IJD evaluation card back at their centers. 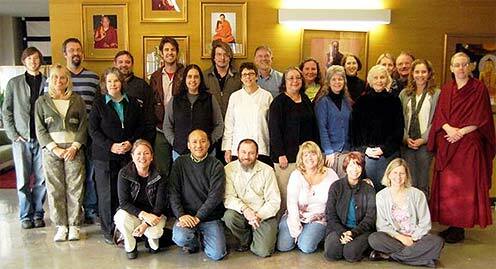 Attendees of the North America Regional Meeting, in Portland, Oregon, USA, November 2008. Foundation Membership now includes the Mandala eZine, launching this month! Join us by becoming a Foundation Member and lend your heart to the cause of happiness for all. 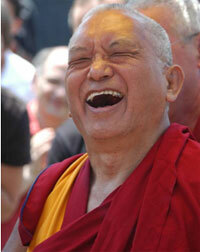 We have added two lovely photos of Rinpoche with His Holiness the Dalai Lama to the FPMT Affiliates Area. These photos were taken by Ven. Roger Kunsang and are offered in the hopes that these will benefit your center, project and service – download and use skillfully! Please remember to check for Discovering Buddhism updates in the FPMT Affiliates Area before beginning any DB module. New resource material and information is often posted on this page. Most recently, some alternate required and suggested readings have been listed for many of the modules. As well, please don’t forget to always send us a schedule of the DB retreats hosted at your center so that we can add them to our list of Discovering Buddhism retreats which is accessed by many of our DB at Home students. Some of you may have seen the FPMT Education Programs Brochure which briefly describes all our standard programs and gives a contact addresses for how to get more information. To date, we have felt these brochures are most effective at Kopan, Root and Tushita as so many students pass through these centers and don’t know where to go next. If you feel it would help your center to make such a brochure available, a print copy can now be downloaded from the FPMT Affiliates Area. In order to facilitate requests for training, Harald has created a brief survey, which includes more information about the time needed for each type of training. Please fill out the survey if you are interested in requesting training. 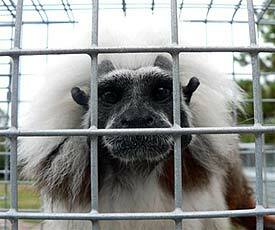 A very curious Relics Tour observer from Jungle Friends in Gainesville, Florida, USA, November 2008. Relic Custodians for the current Americas Tour, describe their time spent with the primates as “special and moving,” and remark how “sobering” it was to realize the suffering the animals experienced because of human desire and ignorance. Please Rejoice! In November 2008, FPMT sent $18,230 to sponsor the attendance of 650 monks – the top scholars from Sera Je Monastery – at the annual winter debate session (Jang Debate) at Gaden Monastery. This money covered the cost of transport (24 buses and 650 train tickets), food and offerings. The annual winter debate includes monks from Sera along with the top scholars from Gaden and Drepung Monasteries. FPMT also sent $18,442 towards the monthly stipend for 137 abbots, ex-abbots and teachers of the Lama Tsongkhapa tradition, including the Gaden Tripa. These incredible teachers do not receive any money from the monasteries and so for many years FPMT has been offering a small monthly stipend ranging from $31 to $10 to the main teachers from Sera, Gaden, Drepung, Gyurme, Gyuto, Tashi Lhunpo and Rato Monastery. FPMT sent $6701 for the Gelug exam attended by 424 monks at Drepung Monastery. This money covered the cost of travel for the monks and the teachers, as well as offerings, food and tea for all the monks attending the exam. Thank you to all the kind benefactors who helped the FPMT support the Lama Tsongkhapa tradition in this way through the Lama Tsongkhapa Teachers Fund. “I would like to share with you my experience gathered from the sick bed. I certainly will be a better doctor now that I have experienced what it is like to be a patient. Wednesday: Three days before surgery I was given the book entitled Practice of the Five Powers: Preparation for Death written by Lama Zopa Rinpoche. While I read, each sentence was like Rinpoche talking directly to me. So clear and appropriate. Tears of joy flowed and I was so happy to have a great guru. I have no fear facing the uncertainty of surgery and its outcome. Sunday: The first day after I returned home from the hospital, Lama Zopa’s book, How to Be Happy, landed on my table, sent by the Lama Yeshe Wisdom Archive. I read it sentence by sentence, and it was like a direct teaching from my guru. I was especially touched by his teaching on the dissolution of the four elements. First, the body dissolves into the earth, and I think now my body enables people to build houses, to plant trees, to dig for gold and petroleum. Then, water dissolves into the streams, rivers and oceans, and I think the water element is now drinking water for all sentient beings, home to the fishes and irrigation water for paddy fields. Then fire dissolves into heat, warming the people in winter, who are cold without shelter, in the fire places of many homes, as energy and electricity. Then wind dissolves into air for those who need breath, as the breeze for those who are experiencing heat. Wow, such a great practice, combining the dissolution of the elements and tonglen together! Rejoice! We wish her a very speedy and complete recovery! For a long time the community at Land of Medicine Buddha, USA has practiced the path of non-harming towards sentient beings. Land of Medicine Buddha is happy to report that we have just completed the green business certification process to expand our practice of non-harming to the environment. The Monterey Bay Area Green Business Program is a successful partnership of environmental agencies, utilities and nonprofit organizations that assist, recognize and promote businesses and government agencies that volunteer to operate in a more environmentally responsible way. To be certified “green,” participants must be in compliance with all environmental regulations and meet program standards for conserving resources, preventing pollution (such as using more efficient lighting, using less toxic products) and minimizing waste. We appreciate the encouragement Lama Zopa Rinpoche offered to students in Mandala [Oct/Nov 2006] after seeing the movie “An Inconvenient Truth,” and are happy that we found a local organization in the Monterey Bay Area that supports businesses in taking this important step towards cherishing others. Opportunities include Retreat Centre Caretaker at Oseling, Spain; Caretaker at Vajrapani Institute, California, USA; and several volunteer positions at Mahamudra Centre, New Zealand.